Join the discussion on our forums! 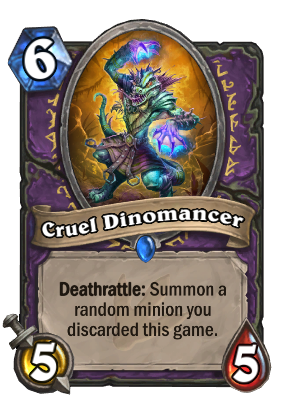 Come discuss Cruel Dinomancer over in our dedicated Cruel Dinomancer discussion topic. As that old saying goes: "you don't get into dinomancing to make friends." This is really great. The problem right now is that everyone and their mom is running Spellbreaker to counter Cubelock. Sad to see fringe cards hurt by this. I've done it! People usually don't hold their spellbreakers for long, and it's either deal with Voidlord or a potential 5/5 Dreadsteed or third Voidlord/lich king. (it doesn't have to be a Dreadsteed) My most favorite deck I've ever made, next to weasel priest. There is an insane combo that a lot of people don't really use. Run a deck with very limited discard options, but two Cruel Dinomancer and ensure that you only discard the dinomancer, and nothing else. This creates a 5/5 dreadsteed that keeps summoning itself back from the dead. Use control cards to keep clearing the board and drop a N'Zoth to unleash a full board of 5/5s that basically re-summon themselves when they die. This combo hard-counters quest warrior because it lets you summon an immortal board that is immune to brawl and soaks up the random 8 damage every turn. I figured this out a few days ago, it's pretty fun. It's kind of hard to pull off, but I think it works pretty well in zoolock with just the two doomguards and maybe two librarians. You often don't even discard with doomguard since you try and play it with an empty hand. The nightmare of double doomguard in hand isn't even that bad since getting a 5/7 out of a 5/5 for 6 mana isn't the end of the world. I think this would actually be a decent card, but Warlock as a class just got shat on by Blizzard this expansion. I don't even really see them at the lower ranks. I had a game where this guy was the only minion I had discarded. He became a 5/5 Dreadsteed for the rest of the game. Actually there are ways of guaranteeing the discard. Basically if you have the 2 cruel dinomancers, spiritsinger umbra, and a single soul fire with the coin. Then you play umbra, coin, soulfire, dinomancer and then you win. So if you are not second then it's more of a case of emptying your hand and soulfiring a dinomancer... or hoping for a 67% chance. Ah, the very first reference to cards that were previously discarded in HS! Quite stronger than Ressurect or Onyx Bishop because with those cards, you had to get the minion on the board originally. THIS bad boy can summon Deathwing on turn 5.
well if you discarded Deathwing before, then you coin this out t5, then the enemy kills it. I guess turn 5 and a half. 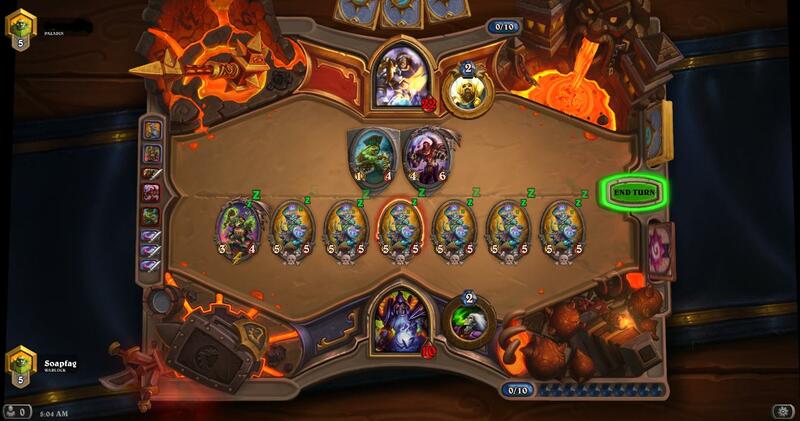 Discard Deathwing, play Spiritsinger Umbra t4 into coin Cruel Dinomancer t5. Finally a card that brings back discarded cards. Cool design, love me some good discard synergy. But if you rly think about it.. Compare this to Cairne, you don´t rly want to discard cards like Doomguard and so on, even if you do, It´s more likely to get some lowlife Silverware golems and stuff you actually trying to discard. So i would say its on the same lvl as Cairne but with rng being worse or alot better.